Double live album from these Finnish proggers. Quite different from any of their studio albums, this material was recorded during a transitional period with a couple of key members leaving shortly after these sessions were performed. The remaining members of Wigwam later directed the band into a drastically different, pop-oriented sound. Only half the songs here are Wigwam originals, perhaps owing to the problems within the band. Of the originals that do appear, only one was properly released later on the relatively poor “Nuclear Nightclub” album. The non-original material includes two tastefully done Beatles covers, and a fantastic reworking of The Band’s “The Moon Struck One” from 1971’s Cahoots. What was once a great four minute song, Wigwam turns into a slowed down, lush, seventeen minute jam full of inspired organ and guitar soloing. While earlier Wigwam work such as “Fairyport” and “Being” are essential prog classics, this live material shows a more relaxed side of the band, unafraid to just jam on their influences. 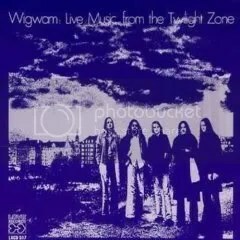 It’s also the last material Wigwam released that I enjoy listening to.